Thermal cameras are becoming a leading trend in video surveillance today. They are the perfect complement to conventional cameras that, when combined, make a wide-ranging and comprehensive surveillance system. 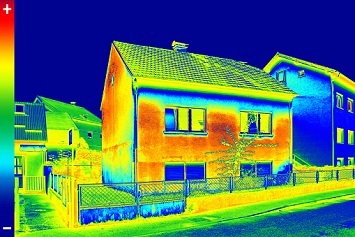 Thermal cameras are increasingly being used in perimeter security applications. Today’s thermal network cameras are the perfect choice for scenes that are completely dark or with bright sun and other adverse conditions. They can penetrate through most atmospheric conditions and are a great tool for detecting people and objects through smoke, dust, and fog. Unlike conventional visible security cameras that measure light, thermal security cameras see differences in the levels of heat emitted by an object, vehicle or person. Thermal cameras are not as useful, however, when it comes to reliable identification. The FLIR PT-Series HD is an advanced dual-sensor security system, combining a cooled or uncooled 640×480 resolution thermal sensor, a 1080p high-definition visible-light imaging sensor, and a high speed, precision pan/tilt system. Multiple high-performance thermal lenses are available, including optical zoom lenses up to 14X. The HD visible camera also features a 30X optical zoom lens with autofocus and low-light capabilities. The FLIR PT-Series HD integrates with FLIR United VMS 8.0 and other VMS software providers. The SightLogix SightSensor thermal camera comes with embedded video analytics and video processing offering features such as electronic stabilization, georegistration, geospatial detection zones, hands-free PTZ steering to zoom and follow targets for more detail, and targets projected onto a site map for real-time situational awareness. The DS-2TD4035 Series Network Bi-Spectrum Thermal/Optical PTZ Camera Systems from Hikvision provides a Smart Tracking feature that uses the thermal sensor to capture targets in any lighting condition and then follow that subject, while a visible light camera provides additional information, resulting in more accurate detection and better situational awareness. Axis thermal network cameras are ideal for intelligent video and offer high accuracy analytics. The AXIS Q19 thermal network camera is ideal for detection around the clock. The AXIS Q29 Temperature Alarm camera features remote temperature monitoring. The AXIS Q8641-E PT and AXIS Q8642-E PT thermal network cameras are designed for unobstructed views and long-distance detection. Sierra-Olympic Technologies Aeron Searcher is a visible and thermal video imaging system with continuous zoom. The long-range surveillance system features either QVGA (320×240) or VGA (640×480) options with simultaneous video and thermal outputs, proprietary image contrast enhancement (ICE), a 3x motorized continuous thermal zoom, and pan/tilt capabilities. Electro Optical Industries Spynel panoramic infrared thermal imaging surveillance system offers built-in detection and tracking software. New updates of Spynel now include V-LRF, a full HD Visible Channel that allows users to use an x30 continuous optical zoom in order to accurately detect and recognize even the smallest of objects. The Laser Range Finder option provides accurate data regarding the distance of the detected threat. The IndigoVision BX thermal camera combines an encoding platform with uncooled thermal sensors to enable advanced video analytics and temperature measurement analytics in a single, easy to install, product. With an effective detection distance of 9,845 feet (3000millimeter), IndigoVision’s BX cameras enable you to see further and more accurately. The 3xLOGIC VERA thermal camera is an all-in-one solution that offers features such as embedded VIGIL Server software, edge-based recording, and advanced analytics. The VERA thermal camera features QR code technology for fast, easy install and setup.